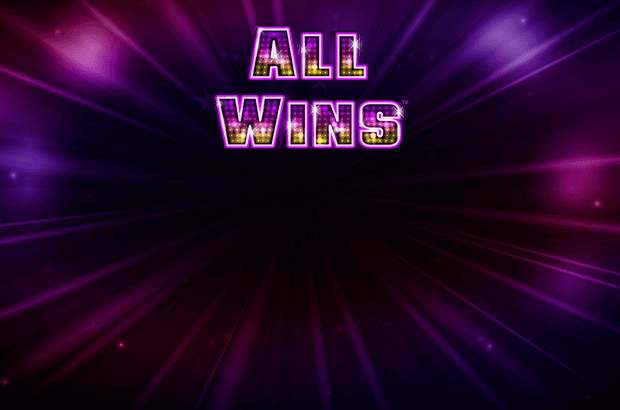 Play All Wins online for free now! 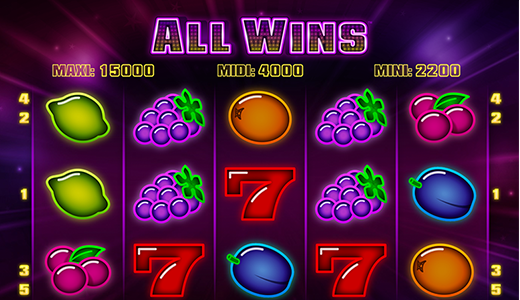 In All Wins, a slot with 5 reels and 5 win lines, the fruits in a neon look are off to space. The Red 7 symbol scores the highest winnings. The goal in All Wins is to line up 3, 4 or 5 identical symbols along a win line. The Jackpot is triggered if at least 3 Red 7 symbols land on a win line. 3, 4 and 5 matching symbols pay winnings in any position of a win line which means that winning symbols don't have to land adjacently. All good things come in threes, which is also true for this game because it comes with 3 different Jackpots: Mini, Midi or Maxi Jackpot! The triggering symbol is the Red 7. If it appears 3 times you earn the Mini Jackpot, while 4 Red 7 symbols win the Midi Jackpot and 5 Red 7 symbols grant you the Maxi Jackpot. Space is beautiful, but mostly empty. There is nothing to see except for stars, planets, moons and… fruits?! Yes, you heard right: fruits! We've catapulted juicy fruits into space in search for exorbitant winning opportunities. And these fruits are now inhabiting the slot machine All Wins, where winnings might grow as gigantic as the galaxy. These extraterrestrial chances are made possible by the Red 7 symbol which can bring you 3 different Jackpots (Mini, Midi or Maxi Jackpot). Reach for those stars!